For the first time I configure VEMS for the R4 engine which has 4 basic injectors and 4 additional ones connected to a separate output. 2. Do I have to set 4 or 8 injectors in the Injector Settings? 3. The F1 help shows that I should assign outputs to the 4 basic injectors in Injector Output Visual and then to the additional ones in the same order. Below, a screenshot as I think it is supposed to look like - am I right or not? 4. 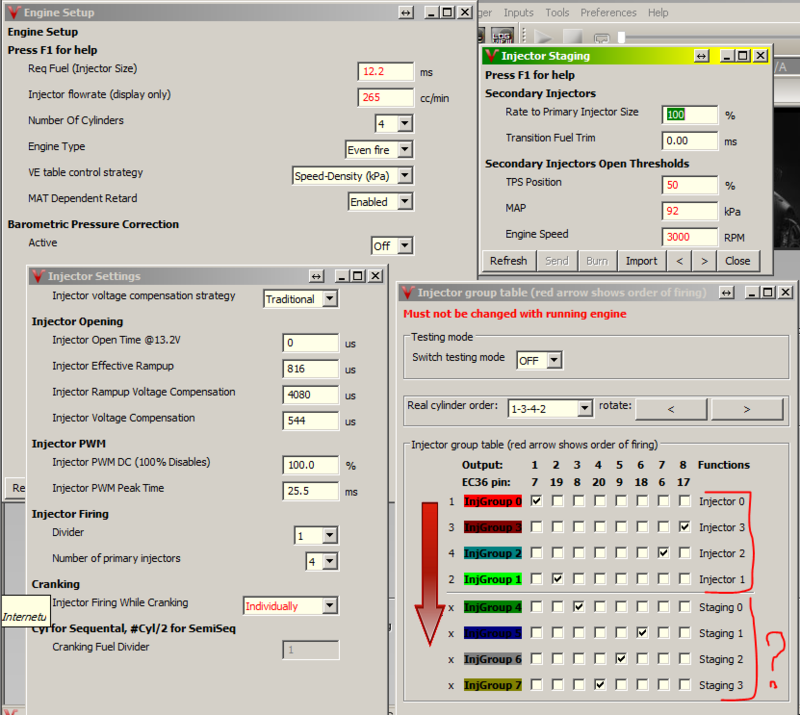 Why the order of the numbering of the channel functions assigned to the outputs is different for the basic injectors and different for the additional ones in the Injector Output Visual window? Should I not worry about it and assume that Staging 0 is an additional injector for cylinder No. 1, Staging 1 - Cyl. nr.2 etc.? Thank you very much for the help the engine has added a turbo and I would not like to cook it first. I have an impression that the staged injectors mode does not work. I have changed the activation parameters of the staged injectors so that they are constantly active, i.e. RPM = 600 TPS = 0 MAP = 20 and has no effect. The injection time has not decreased twice, I also removed the plugs from the injectors to make sure they do not work - they do not work. I made a firmware upgrade from version 1.2.11 to version 1.2.38 - no effect. Is there anyone who has successfully launched staged injection? Yes, i did lot of cars with staged injectors. PW in logs is the same with staged injectors, so you will see more than 100% injector dc.